This is a simple app that combines all my orientation change patches plus Homescreen patch by coderus. It also installs own app in which you can manage which of these plugins are active. It's different from Allow any orientation for all SailfishOS applications by coderus, because it allows apps one by one, so apps that have bad layout for landscape won't rotate. I think this is a problem with PM3. Albeit, once the patch is installed, there are 2 patches within that will not apply; Allow calculator & Allow contacts - otherwise all other components of the patch are working as expected. If this is the last patch you installed on your device, unapply the patch above it, then try reapplying this patch, then reapply the patch above that you unapplied - which sometimes I get on my device but not always, hence I think its a problem with PM3 (which is BETA). Hi. No, there is not any new version coming, I don't use Jolla anymore. Hi, I wrote since a year :) . I am using this patch again, still missing a selectable option to rotate only left turning (at least for me) :) . maybe if you have some free time could you add this feature please? And perhaps, Could you add also the People app please? Fantastic, it works on 2.0.1.11 too. One patch for all, it lets you choose on which app you want to put a patch without the needs to download patch by patch. It works also to allow homescreen rotation, I see just portrait inverted rotation isn't allowed, I guess for the known problem of answering or refusing mistakenly a call or slmething like this. I see also that Jolla handle landscape and lanscape inverted as same thing, infact if I enable lock rotation on landscape the phone doesn't rotate to portrait but can rotate to landscape inverted(I guess it would be the same for portrait if portrait inverted wouldn't be blocked).But that's Jolla fault, not so bad after all. Said that, I'd like to see a guide on how to enable this manually(perhaps editing some files?) instead of a patch, same for any other patches. Patches are not only a security threat, with some guides and ssh support(developer mode, usb cable or wlan connection and computer, not needed but helpful) they're also useless. At the least, if it is something thst can be fixed in the way I can think of, if it's something more complicated, that needs a daemon running jn the background to performe some operation allowing the edits we wants(i.e. patchmanager), then I'm thinking wrong. Actually the patches are the best approach - the daemon does not rewrite the files on the fly, but once you activate a patch, it rewrites the files according to instructions in patch. It's good when you have newer version of the file (when you update Sailfish OS) and try to apply the patch, it will fail, because it's no longer valid and thus it will prevent you from making the phone useless. The patch does exactly what you would want to - rewrites those files, but saves a copy of the original file in case you want to unapply the patch. When you edit the files manually, you cannot update your Jolla - it can make your device unusable. That's why you should also unapply patches before updating Sailfish OS. The patchmanager is not a necessary thing for such tasks, but it prevents you from unwillingly breaking your phone. Homescreen rotation doesn't work in 2.0.0 (Saimaa). Hello, app is now updated to support 2.0.0.10. Does the patch have a caustom layout for any other app? Hello, I will fix ASAP. Custom layout is only for calculator. 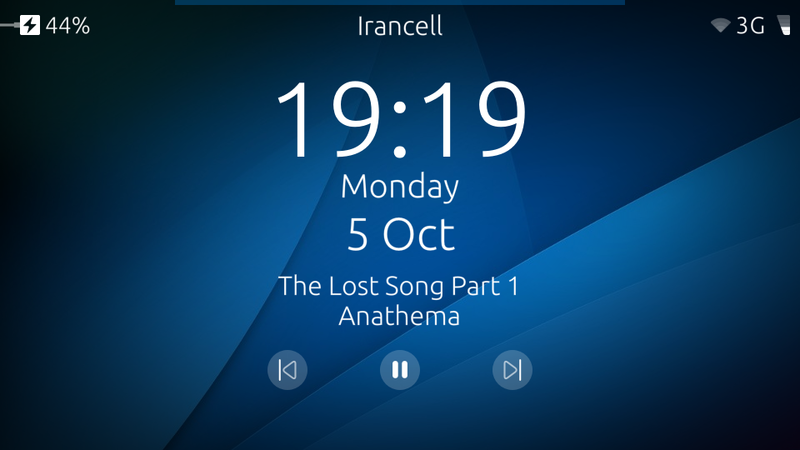 The clock in landscape lock screen is vertically centered, so while playing music it overlaps with media info; see the screenshot. 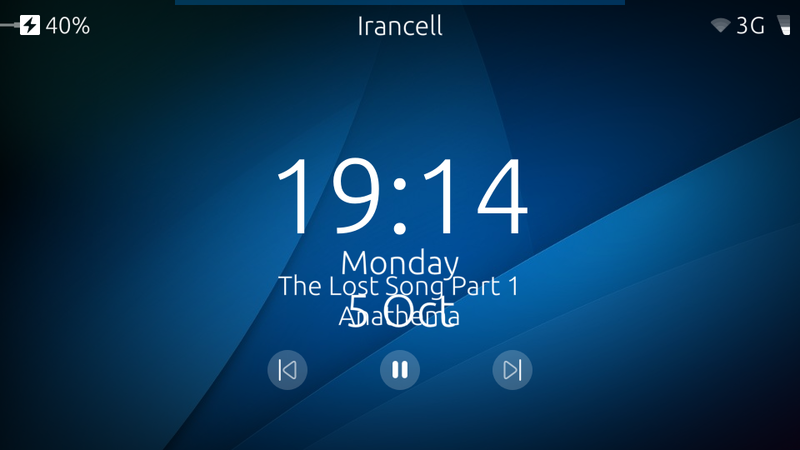 I've found a workaround for this which makes the clock shown on top even in landscape view: remove lockScreenPage.isPortrait from /usr/share/lipstick-jolla-home-qt5/lockscreen/LockItem.qml line 133; see the screenshot. I think this will make the patch more great. Can we have a code lock view in landscape? I mean something like Calculator, numbers in a row, backspace and emergency call above, and unlock key below. Hi, nice job guys! But 1 thing, possible that rotates only for left side? Because this patch is rotates for me left and right side, but if it would be selectable or just left side I think enough... :) Thanks. Well, I could try to separate the Homescreen and Lock Screen, but I'm not sure right now, I must take a look at the source codes.